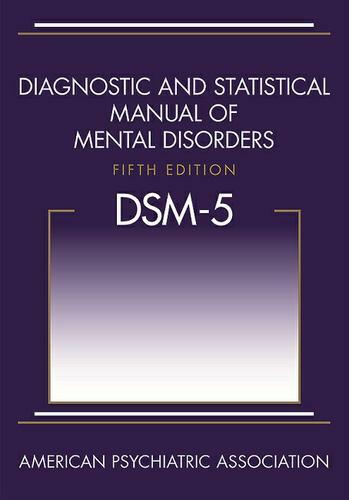 This new edition of Diagnostic and Statistical Manual of Mental Disorders (DSM-5®), used by clinicians and researchers to diagnose and classify mental disorders, is the product of more than 10 years of effort by hundreds of international experts in all aspects of mental health. Their dedication and hard work have yielded an authoritative volume that defines and classifies mental disorders in order to improve diagnoses, treatment, and research. The criteria are concise and explicit, intended to facilitate an objective assessment of symptom presentations in a variety of clinical settings -- inpatient, outpatient, partial hospital, consultation-liaison, clinical, private practice, and primary care. New features and enhancements make DSM-5® easier to use across all settings:  The chapter organization reflects a lifespan approach, with disorders typically diagnosed in childhood (such as neurodevelopmental disorders) at the beginning of the manual, and those more typical of older adults (such as neurocognitive disorders) placed at the end. Also included are age-related factors specific to diagnosis.  The latest findings in neuroimaging and genetics have been integrated into each disorder along with gender and cultural considerations. The revised organizational structure recognizes symptoms that span multiple diagnostic categories, providing new clinical insight in diagnosis.  Specific criteria have been streamlined, consolidated, or clarified to be consistent with clinical practice (including the consolidation of autism disorder, Asperger's syndrome, and pervasive developmental disorder into autism spectrum disorder; the streamlined classification of bipolar and depressive disorders; the restructuring of substance use disorders for consistency and clarity; and the enhanced specificity for major and mild neurocognitive disorders). Dimensional assessments for research and validation of clinical results have been provided. Both ICD-9-CM and ICD-10-CM codes are included for each disorder, and the organizational structure is consistent with the new ICD-11 in development. The Diagnostic and Statistical Manual of Mental Disorders, Fifth Edition, is the most comprehensive, current, and critical resource for clinical practice available to today's mental health clinicians and researchers of all orientations. The information contained in the manual is also valuable to other physicians and health professionals, including psychologists, counselors, nurses, and occupational and rehabilitation therapists, as well as social workers and forensic and legal specialists.